Children between The ages of six to thirteen are generally a tricky period for parents to handle. If they are nine and below, they aren’t the toddlers who need constant supervision anymore; but yet, they considered still too young to be left alone. By the time they hit ten, they’ve already got a certain degree of independence, but (thankfully) are not quite in rebellious teen-zone yet. They’re on the cusp of adolescence, still childlike but also longing for some of their own freedom to explore. How does one bring them overseas, ensure they’re safe but also give them enough space to have their own fun? Family-friendly all-inclusive beach resorts are a great destination, especially when you’ve got children of varying ages. These resorts usually have a variety of activities catering to different ages. So if you want to go for a mommy-and-daddy spa day, you’ll know the kids are having safe fun on their own. Read on for the top 10 beach destinations that ensure a splashing time for the whole family around Europe, all along the Mediterranean Coast. Set on the north-west coast of Greece is this little hidden seaside town which remains largely untouched by development. Ancient Corinthian ruins line the rocky nature reserves overhead of the beach, where remnants of fortifications like canons and dungeons will excite the young ones. The beach itself is a beautiful strip of white sand and blue water, mostly unspoiled and hardly crowded. There is a sharp drop-off in the water, so your kids should be older than six, and fairly good swimmers if you decide to bring them here. Our pick for you would be the affordable Carolli hotel, situated right next to the beach. You can get double rooms or one-bedroom apartments for the family to share. What sets the village of Lindos apart from the bustle of modern Rhodes is its’ tranquility. This quaint town has all the charms of a typical Greek island — white-washed buildings, donkey carts and cobbled streets — but without the busloads of tourists and stuffy heat they bring to more popular islands like Santorini and Mykonos. You can bring the kids up on a trip to see the ruins of the Lindos Acropolis, which also gives a spectacular view of the ocean. You can get a donkey ride up to the Acropolis, an idea that might excite the children. There are two beaches within walking distance, the Lindos main beach and St. Paul’s Bay, which you can see from the top of the Acropolis. 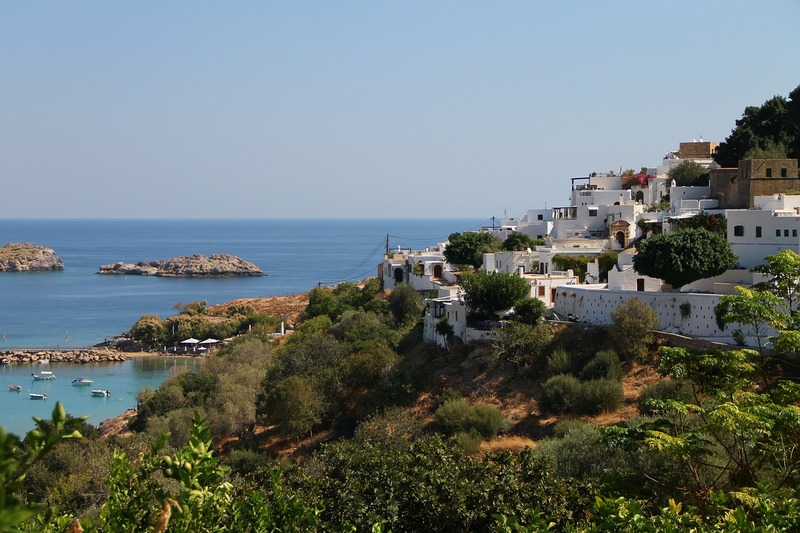 From Lindos, you can take day trips out to see the rest of Rhodes, such as Old Town — a UNESCO World Heritage Site with a rich, turbulent history. If your kids are into Greek myths (as most kids are), they’ll definitely enjoy a trip to Lindos as all the stories come to life with everything they see. If you’re looking for somewhere that doesn’t involve moving out of the resort compound, this is the place for you! Pine Cliffs is a resort residence with a tennis academy, golf course and Kids’ Club (‘Porto Pirata’) on site, so you never have to look far for activities to fill the day! There are five tennis courts open from morning till evening, with tennis instructors who conduct lessons all day, so if your kids are already tennis enthusiasts or want to learn a new sport, this is a fantastic option for them. If they want to have fun with other children of the same age, Pine Cliffs have kids clubs catering to two different age groups — the Pirate Club for ages six months to seven years and the Junior Club for ages eight to thirteen. Kids can enjoy fun games like darts, soccer, mini-golf and shooting with other kids! With the kids off having fun, you can have a day to yourself just to relax and soak up all the Portuguese sun amidst the stunning cliffs. 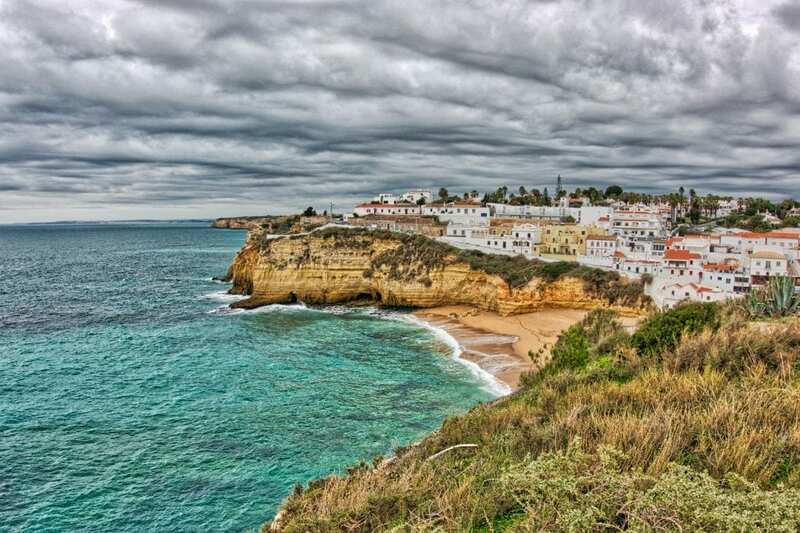 Carvoeiro is a picturesque little resort town blessed with a stunning landscape and tawny beaches. Its charm is the laid-back, peaceful, making it ideal for a family holiday. Furthermore, you won’t get late-night drunks or boisterous groups of party animals walking through town here. Unlike Albufeira and Praia de Rocha, Carvoeiro is not a party destination, so the kids will be well-shielded from the slightly less-than-savory debaucheries that can go on in resort towns. The coastline is beautiful and full of caves and rock pools for the kids to explore. Older kids aged ten and up will appreciate the little adventures they can have while frolicking at the beach. Near the French border, an hour away from Barcelona spreads Costa Brava, a magnificent landscape of green coves, stunning coastlines and charming medieval towns. The name means “wild coast”, and lured many artists such as Salvador Dali and Picasso to its shores. The scenic landscape of Costa Brava makes it ideal for exploring inland via car or even bicycle. If your kids can cycle well, they will enjoy a day out on a rented burricleta, an e-bicycle. Trails will take you through dirt paths to the old towns of Fontanilles, Palau-Sator and Peratallada. You can even get an artisanal spread for a picnic along the way! The seafood here is also very good — you can expect to get bright red shrimps and fresh catch of the day from the Palamos fish port. After you’ve done your holiday’s worth of hiking and exploring, unwind on the lovely beach of Tamariu together as a family. If you still want a luxurious getaway while being kid-friendly, Viva Zafiro Alcudia is the place for you! This five-star resort has excellent facilities, numerous pools, a tennis court, a mini golf course and a big children’s playground. One of the pools is found to be shaped like a mini pirate-ship water playground, with slides and knee-high water, so it’s perfect for the younger children to splash around in. There are lots of sunbeds around, so you can lounge while also keeping an eye on the kids. Majorca itself is one of the most beautiful islands Spain has to offer. The old town of Alcudia is three kilometers from the port town and is peppered with Roman ruins and charming yellow buildings on narrow cobbled streets. A beautiful beach cove lies nestled between the mountains, lush forests and lemon groves of south-west Turkey. The quiet little town is largely untouched by development and protected by the Turkish government. The vibes are chill and the air is cool, in summer it comes to life with the scent of jasmines, rustling leaves and occasional prayer calls from the local mosque. The main attraction is the hatching of loggerhead turtles on the beach as they make their way to the sea. Further up inland, you can hike to the ruins of the ancient city of Olympos at the mouth of the Akcay River. Marcus Aurelius’ tomb is supposedly one of those in the necropolis. If your kids are fans of ancient Greek and Roman stories, they’ll find this place particularly fascinating. This island off France is known for its’ scenic cycling trails and great oysters. You can cycle for miles and enjoy an undisturbed view of the island’s long beaches and picturesque villages. If you have children who are up for adventures on a bike, this is the place for you. The beaches are prime spots for mussel-harvesting, so you can see wooden stakes, called bouchots, lined up on the sand. You can also cycle further up to see how the famous Marennes-Oleron oysters are cultivated in salt pans. Another exciting option is to turn your family holiday into a camping trip — the Indigo chain with two pretty campsites in Les Pins, located in a pine wood, and Les Chenes Vert, in an oak wood, on the western side. Pizza lovers, listen up! Calabria is an under-the-radar Italian beach paradise that offers 500 miles of coastline along the Tyrrhenian and Ionian seas. Being near Naples and Sicily, it is home to some of the best pizza you will try. After eating here the kids will never want to set foot in any Domino’s again. 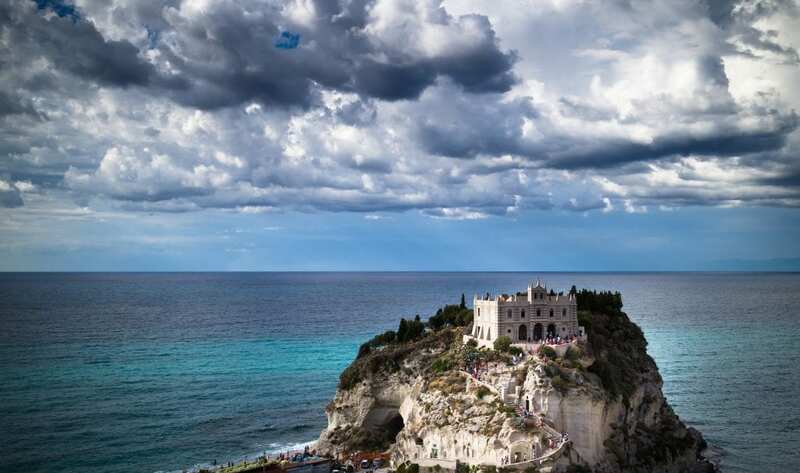 A former Greek stronghold, you’ll also find a lot of Greek ruins along the Calabrian coast. In fact, the legendary six-headed man-eating monster Scylla of the Odyssey supposedly dwells in the cliffs of Scilla. If overcrowded Positano does not appeal to you but you would still like an Italian beach holiday, Calabria is your answer. Between the famous Croatian cities of Dubrovnik and Split lies the Makarska Riviera. It is a deep, sheltered bay set against a dramatic backdrop of Mount Biokovo, with lovely beaches stretching far and long. You can take day trips to the other islands by boat, or rent out paddle-boats and jet-skis for the family. The waters are shallow enough for young children, and the tides are gentle. So why not take advantage of the shallow waters by also bringing along a unicorn float for your young children to enjoy and relax in the waters with? Otherwise, if you are the sort to fancy some hiking, Biokovo Nature Park is nearby and offers fantastic views of the Italian coast from way up.